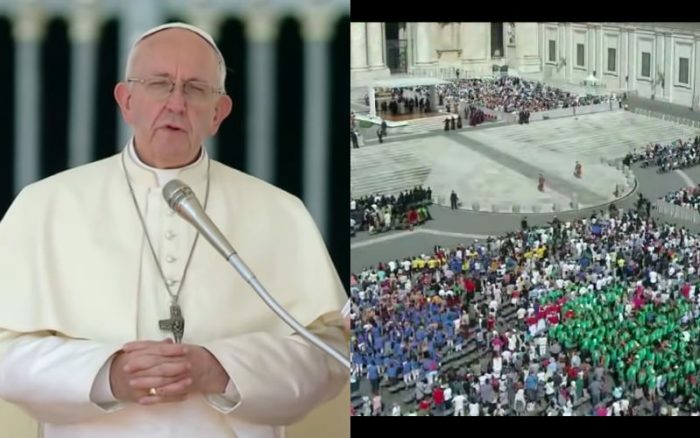 Earlier today, the following claim started circulating around social media: that the crowds in St. Peter’s Square for Pope Francis’ weekly General Audience were chanting “Viganò! Viganò! Viganò!” – and that it was caught by the Vatican News cameras. “Viganò” would of course be a reference to Archbishop Carlo Maria Viganò, who recently published an 11-page document accusing a wide range of bishops of being complicit in covering up sexual abuse, including Pope Francis. But is the claim on social media true? So the crowd was indeed chanting something that had three syllables and ended with a clear “o.” But was it “Viganò”? Apparently there was a Confirmation group visiting from the nearby Italian Archdiocese of Lucca. Their bishop is Archbishop Italo – and the group was chanting his name. Archbishop Viganò has made serious allegations against the Holy Father – allegations that deserve to be investigated carefully, with a just response based on the truth, whatever it is. Whether you think Archbishop Viganò’s claims are true or false, it’s very important that all Catholics only spread the truth, even on seemingly minor points like this claim being spread on social media.